French Emblems: Emblem: Divina scrutari, temerarium. It is foolhardy to scrutinise the ways of the gods. Sensus praepedit, & linguam matura ligat. Haeret; at ille sapit qui vestibulum haud superat. The Egyptian palm tree, when young, keeps thirst at bay, but when the same tree is fully grown, it befuddles the senses and ties the tongue. He who tries to examine the high mysteries of God, will be stuck for words and thoughts; but he is wise who goes no further than the first step [lit. the entrance-hall]. Pulcra puella comas ambit sibi palmitibus. & in divinitatis abyssum ineluctabilem corruunt. recta Confessione memorat Iustinus martyr. rologium, altera Palmam symbola gerebat. The metre is Cyrillian [Cyrillic? ], each line being a pentameter hypercatalectic, as in: “The pretty girl bound her hair with vine-shoots”. 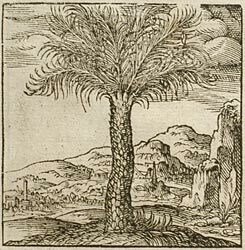 The Egyptian palm, called balanus [‘date-palm’] by Theophrastus on account of its fruit, is a large tree, not standing straight, but twisted, with a leaf similar to the myrtle. It is called poma [‘draught’] by Dioscorides (who paints a picture of it as having one prominent branch), on account of the plentiful juice which can be turned into a drink, and also adipsos [‘thirst-quencher’] from its ability to keep thirst at bay. This juice, harvested before it has fully matured, slakes the thirst; but if you drink it when it is mature, it befuddles your senses, makes you stumble, ties up your tongue, and, taking over the faculties of your mind and body, gives the impression of the evil of drunkenness, as Solinus observes in ch. 45 of his Memorabilia. This emblem warns us that a thoughtful and deep enquiry into matters theological, and one that is made with fruits that are fully mature - that is to say, by those who consider themselves capable of a complete understanding of every mystery - is a dangerous business. For however deeply such men as these dig to search out the secrets of God and his indivisible Trinity, they only [p.104] get caught up in a yet darker, deeper murk, and plunge headlong into the inescapable abyss of theology. Simonides - a man most renowned for his wisdom - was once asked by Hieron the king of the Syracusans, to define God for him, at which he asked for a day’s grace. The next day, asked to explain about religion, he begged for two days’ grace. And when he kept on redoubling the number of days, and Hieron asked him in amazement the reason for what he was doing, he replied that the longer he thought about the matter, the more complicated and difficult it seemed to be. I believe the Egyptian priests had this in mind, the ones who used to utter in song only the sound of meaningless syllables, to demonstrate that they could reasonably pronounce nothing sure or certain concerning God. Hugo Eterianus (not the least learned of theologians) turned the emblem to this meaning, when he started his discourse against the Greeks on the Holy Spirit at the beginning of his work. When I so much as begin to taste the fruits of the highest form of philosophy, I seem to myself to be like a tortoise in the water, which wants to swim across the sea: my thought-processes are beset by numbness; my mind goes into a decline; my tongue is tied, as if it had tasted the Egyptian palm, which is called Adipsos by the Greeks (the reading adiperos, where it occurs, is faulty). [p.105] Dear me, you can see how appositely this emblem [can be] used in explaining the difficulty of the tricky business which one has embarked upon. After all the nature of the divine is not even for angelic, let alone human, tongues to tell or understand, as Martial, Bishop of Limoges wrote in his letter to the Bordelais. Nor was Plato silent on this same matter, calling God ineffable and unnameable, to discover whom was not easy, to understand, impossible; or as Hermes Trismegistus said, to grasp hold of the idea of God in your mind is a difficult thing, but to put it into words is impossible. It is to this that the very ancient Iambic line that Justin Martyr records (in his book On Righteous Confession) as coming from the mouth of Socrates refers: Ouden gar anthrôpoisi tôn theiôn saphes, that is to say, ‘Nothing of divine matters is clear and straightforward to mortal men’, meaning, things that are of God should not be enquired into to carefully. And so when it comes to sacred philosophy, it is better to make your harvest of the young palm-leaves, which quench the thirst, seeing as we behold those wise men who consider themselves alone capable of enjoying the mature fruits: their throats are dry, their tongues tied, their wits dimmed and darkened, with staggering steps they are pitched and tossed hither and thither in it. Let us rather follow the wise advice of Athanasius, who taught [p.106] in his Against the Arians bk. 3, that simple faith is stronger than painstaking and studied reasoning. The emblem can also be applied to those sophistical and prickly pursuits of philosophy, which, though they can be used to wet your lips (so to speak), have nevertheless no power to slake your thirst; to land on which (as if on the Sirens’ rocks) and waste away your days in such pursuits is nothing but [or ultimately] a lunatic endeavour. For when it comes to that, the stupid, the blind, and those drunk on the sweet poison love to dull the sight of their audience’s wits with soot, and meanwhile falsifying the name of the elusive, most sacred philosophy, as Herodes Atticus argues very well in Gellius, bk. 1. Another good comparison for this Adipsos tree is with the way of life at court, which can be followed and sampled for a little while in immaturity, and not without profit: but to drink deep [lit. to be moistened with full throat] of its seductive juice, once it has grown mature, is not only to tarry in it, but also to die,* as it destroys our perception, causes a healthy mind to fester, puffs men up with arrogance, and makes them more insolent than Pallas (who disdained ever to speak with his own freedmen, as Tacitus writes in bk. 13). For out of the innumerable people there, you will scarcely find one like Eutherius, whom [p.107] Ammianus records (bk. 16) as being the only honest man and respecter of trustworthiness and loyalty in all the entourage of the Emperor Constantius. Perhaps not irrelevant to the principal meaning, which I spoke of first, is what Clement of Alexandria tells of the sacred rites of the Egyptians: that next after the Singer, who holds the place of honour, comes the Horoscope priest, who in one hand holds the Horologium [a water-clock or sundial], in the other a symbol of the Palm. * A play on words between immorari and immori. 1. Cornelius Musius (Cornelis Muys) of Delft was a preist and a neo-Latin poet (d. 1572). 2. The Cyrillian or Cyrillic verseform has not been identified, either in Lewis & Short, or online sources such as Perseus. 3. Collectanea rerum memorabilium. For Solinus see emblem XIIII ([FJUb014]). 4. The overmighty freedman of the emperor Claudius, proverbial for his wealth.